Prepare the gnocchi: wash the sweet potatoes and poke them all over with a fork. Place potatoes on a plate and microwave on high until tender, about 5 minutes per side. Cut potatoes in half and scoop out flesh into a medium bowl and mash thoroughly. Transfer 3 cups worth of flesh to a large bowl. Add in the strained ricotta and stir until thoroughly combined. Stir in parmesan cheese and salt. Start adding flour 1/2 a cup at a time until a soft dough forms. Shape the dough into a large ball. Lightly flour your work surface and divide dough into six equal portions. Take one portion and roll it on work surface or between hands until it’s about 20 inches in length. Cut dough into 20 even pieces to form each gnocchi then set gnocchis aside on a floured pan. Repeat the rolling and cutting process with the remaining five pieces of dough. Use the back of a fork to press indentations into each gnocchi. Make brown butter sauce: Melt the butter in a medium saucepan over medium heat, stirring occasionally. Cook the butter until foam subsides and butter turns golden brown color, about 3 minutes. Turn off heat and add sage leaves. Let them to cook for 1 minute. Remove butter from heat and stir in balsamic vinegar, salt and pepper. Cook the gnocchi: bring a large pot of salted water to a boil. Add 10 or so of the gnocchi to boiling water, stir. Let the gnocchi cook until they float back up to the top, about 1 minute. Remove gnocchi with a slotted spoon to a serving bowl. Repeat the cooking process with the remaining gnocchi. Toss the warm gnocchi with the prepared brown butter sauce. Garnish with Parmesan cheese, sage leaves and serve. Notes: Sweet potatoes vary in how much moisture they contain, but do not add too much flour or gnocchi will be dense! Try to add the least amount of flour while still making a cohesive, pliable dough. You’ll likely end up using about 2 cups of flour to reach this point. 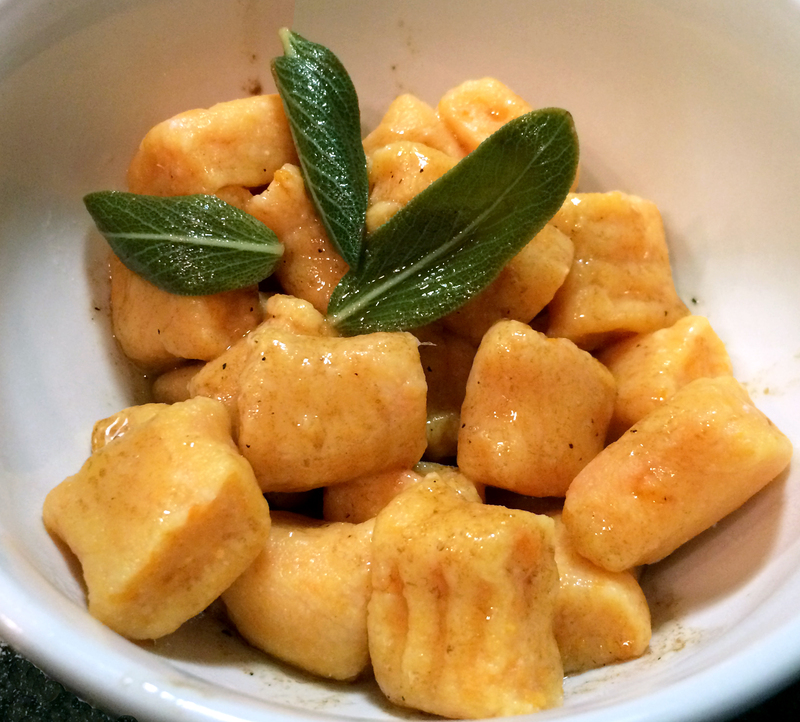 Raw gnocchi can also be frozen and cooked at a later date for a quick dinner!